You know you need a new job. You know you should be earning more. But how do you get there? 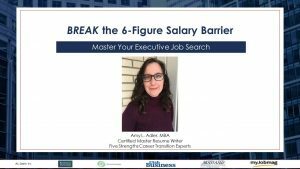 Watch “Break the 6-Figure Salary Barrier: Master Your Executive Job Search,” hosted by Amy L. Adler, Certified Master Resume Writer. In less than 45 minutes, you’ll learn my best strategies for launching the job search designed to get you in front of the right decision makers.